China Railway Construction Corp., a top state-owned railway builder, has halted work on a new maglev train production plant in Changsha in response to the government’s tightening scrutiny of urban transportation investments. Central authorities are concerned that excessive local government transit projects will drive up public debt and create overcapacity. 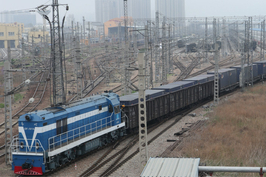 The suspension of the facility, backed by CRCC’s subsidiary China Railway Construction Heavy Industry Co. (CRCHI) in central China’s Hunan province, came in early May shortly after the National Development and Reform Commission (NDRC) held meetings with several state-owned transportation-equipment makers regarding a March policy on railroad investment, multiple sources close to the matter told Caixin. CRCC and CRCHI didn’t immediately respond to Caixin’s request for comment. Maglev is short for magnetic levitation, a system in which powerful magnets lift a train up off a single, central rail and propel it forward. The NDRC in March issued a policy notice ordering local governments and companies to rein in railroad investment and equipment production. Companies and local authorities are not allowed to add new rail-car production unless existing facilities are operating at more than 80% of full capacity, according to the notice. A NDRC official said the regulator ordered local governments and companies to launch inspections of existing production capacity and report data to the commission. The halted facility in Changsha is part of CRCHI’s plan revealed last November to invest 10 billion yuan in a rail transit equipment industry park in Changsha, according to the local government website. The plant was expected to produce 60 maglev trains a year after completion, China News Services reported in August, citing Wang Quansheng, a CRCHI official. The impact of the suspension is limited as construction is still at an early stage, a transportation industry official in Hunan said. China has experienced a maglev boom since October 2016, despite analysts’ warnings of limited demand. Intercity transportation in China has been dominated by high-speed rail, while the subways are the main urban rail transit mode, leaving little room for maglev systems, said a source at CRRC Corp., the top railroad equipment maker. China has the world’s largest rail network, covering 127,000 kilometers at the end of 2017, according to the country’s railway operator China Railway Corp. High-speed rail makes up 20% of the network. A number of state-owned and private companies have announced plans to develop maglev trains and systems since 2016, including electric car maker BYD Co., China Railway Group, CRCC and China Railway Signal and Communication Corp. The enthusiasm sparked concerns of overcapacity for maglev production. 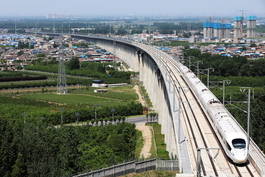 China currently has three maglev train lines in operation, with the world’s only commercial high-speed maglev line in Shanghai. 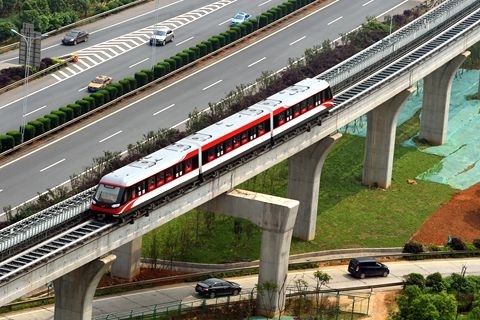 Two medium- and low-speed projects are Maglev Express in Changsha and Maglev S1 in Beijing.